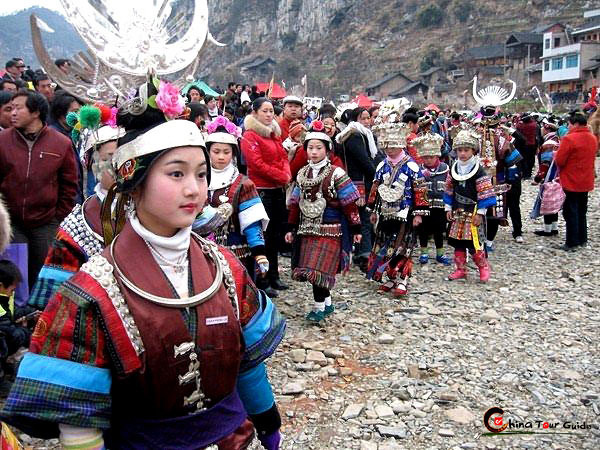 The Miao Lusheng Festival is the most ceremonious traditional festival celebrated on the grandest scale at Zhouxi, Kaili City, and the Gulong Village in Huangping county. Zhouxi Lusheng Festival is held from the 16th day to the 20th day of the first lunar month, attracting over 40,000 people of different nationalities from Kaili City, Danzhai County, Majiang County and Leishan County. Gulong Lusheng Festival is held from the 27th day to the 29th day of the ninth lunar month, attracting 30,000 to 40,000 people. The Lusheng performance troupe blow Lusheng to pray for good weather and bumper harvest. Girls at the festival circle in rings as they dance to the pleasant melody of Lusheng. At the lusheng Festival, hundreds of the lusheng (bamboo-pipe instruments) in dozens of groups are simultaneously played and the music is reverberating far and wide. 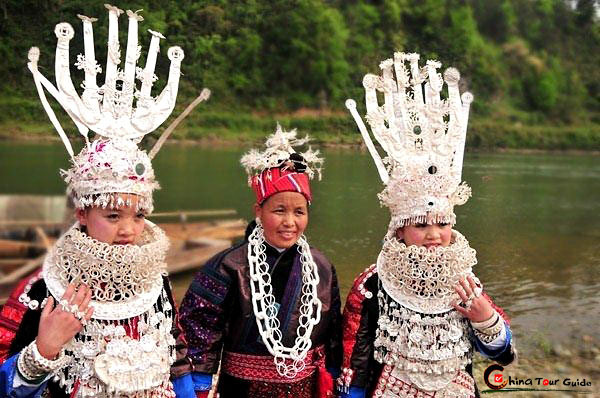 Hundreds and thousands of the Miao girls wearing silver-decorated clothes and head ornaments are dancing together to the rhythms, forming one circle after another together on the lusheng playing ground, and appearing a silver swirling sea. The Festival is both an exhibition of prosperity and a competition of skill and wisdom. Those noble and dignified, well-behaved youngsters are praised and those clever and deft, beautifully-decorated girls are admired. Therefore, playing the Lusheng music and performing the Lusheng dance are an important part of many Miao festivals. During the Lusheng Festival, people can enjoy other activities, such as bullfight, basketball match, tug of war, mountain-climbing, race, chess-playing, etc. Miao musicians in Xijiang village are performing on Lusheng. Almost every Miao man can play Lusheng from an early age.